This sweet Moroccan pastry takes its name from a traditional presentation of coiling pastry-wrapped almond paste into a snake-like shape. M'hancha can be made quite large for serving at social gatherings; guests enjoy the pastry by breaking off small portions from the outermost part of the coil. Alternatively, m'hancha may be shaped into small, individual-sized coils, or simply prepared as small stick-like lengths of wrapped almond paste. Here, however, I'm explaining the method for making a large pastry such as that shown. (Don't be intimidated by the lengthy instructions – it's easier than you think.) See the Tips below if you want to individual mini pastries. Different versions of traditional Moroccan almond paste may be used for the filling. I'm suggesting the one my sister-in-law taught me for use for almond briouats; it's a little more work to make as it calls for frying half of the almonds, but the effort is well-rewarded in terms of flavor and texture. To save time, you can avoid that step and simply use all blanched almonds instead. 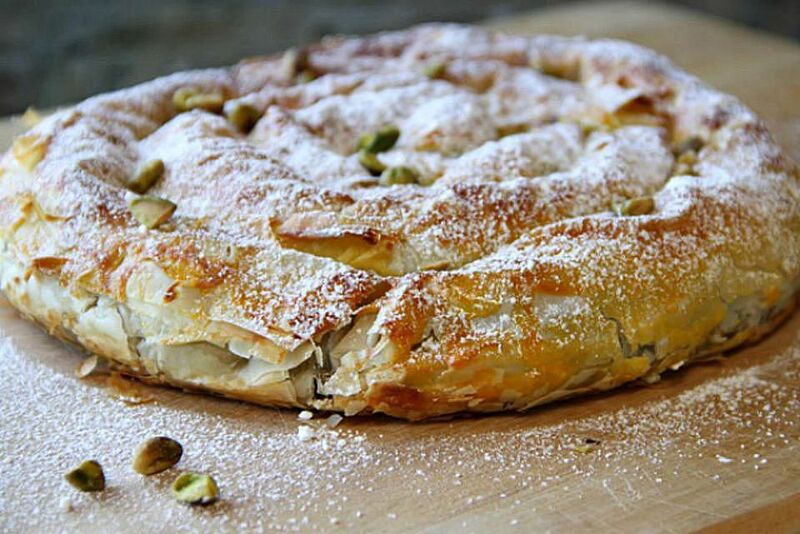 Warqa is the traditional paper-thin pastry used in Morocco; see the tips at the end of the recipe if you'd like to use phyllo dough instead. The baked pastry may be decorated with a generous dusting of powdered sugar, or it may be given a brushing of warm honey followed by a garnish of ground or sliced almonds. Also try making Savory M'hancha with Kefta and Vegetable Filling. If you are starting with whole, raw almonds, blanch and peel them. Allow them to dry, then fry half of the blanched almonds in shallow vegetable oil until golden brown. Be careful not to burn them. Remove and drain the almonds in a strainer or on paper towels. Place the fried and unfried almonds in a food processor along with the sugar. Process until very powdery, then continue processing a bit longer until the mixture begins to turn to a paste. Transfer the ground almonds to a bowl. By hand, work in the cinnamon, gum arabic, butter and orange flower water. Knead until all ingredients are evenly combined into a smooth almond paste. Take a handful of the almond paste and squeeze it into a log shape. Roll the log back and forth on your work surface to make a long stick of paste the thickness of your thumb or index finger. Do not taper the ends. Repeat with the remaining almond paste. Preheat your oven to 350° F (180° C). Line a large baking pan with parchment paper. Arrange your round warqa leaves into a neat stack and trim straight across the top and bottom with a sharp knife or scissors to make rectangular-shaped pastry leaves. On a large work surface, arrange three or four rectangles of pastry horizontally, overlapping each rectangle with about two inches (5 cm) of pastry dough. Use egg yolk to seal the overlapped edges of dough. The overall length of the overlapping pastry leaves should accommodate half of your almond paste logs. Brush the connected pastry leaves with melted butter. Line up logs of almond paste along the entire length of the bottom edge of the pastry. Press the logs together into a single long roll. Allow a little empty space of pastry after the last log on the right side; this will allow a small length of hollow pastry to be tucked under the m'hancha once it's shaped. Carefully enclose the almond paste in the warqa pastry by rolling up from the bottom to the top. When the roll is nearly finished, brush the last inch or two exposed pastry dough at the top with egg yolk, then continue rolling to the top edge to seal. Starting from the left end, carefully coil the wrapped almond paste; try to avoid cracking the pastry as you work. The hollow end of the pastry dough should now be at the very edge of the outermost coil. Brush the hollow piece of pastry with egg yolk and tuck it under the coil, pressing to seal it to the bottom. Repeat with the remaining logs of almond paste and pastry dough. You can then add this new length of wrapped almond paste to the existing coil, or shape a second, separate pastry. Transfer the rolled pastry to your prepared baking pan. Brush the top and sides with melted butter then brush with the egg wash. Remove the pan from the oven and garnish as desired. Heat the honey in a small saucepan until hot and thin. Stir in a small spoonful or two of orange flower water. Brush as much honey syrup as desired over the still-warm pastry and garnish with chopped or sliced almonds. Allow the snake pastry to cool, then generously sift powdered sugar over the top. If desired, ground cinnamon may be added to the garnish, either by dusting lightly over the powdered sugar or by arranging thin lines of cinnamon across the top. To make m'hancha in advance, completely shape the pastry, including brushing with the egg wash.
Wrap and freeze, then bake the day of serving, allowing extra time if placing the pastry in the oven directly from the freezer. To use phyllo dough instead of warqa, follow the method described above, but use two or three layers of phyllo for every single layer of warqa, remembering to brush each layer with melted butter. Keep any unused phyllo covered under a damp towel until ready to use it. To shape mini m'hancha, divide the almond paste into 20 portions. Shape each into a narrow cylinder a little longer than your middle finger. Cut the round warqa sheets in half, brush each half with butter, then fold each piece in half to make a wedge. Take a folded wedge of pastry and lay it in front of you, wide curve at the bottom. Place a log of almond paste along the bottom (if necessary, roll it back and forth to elongate it to nearly width of your pastry) and roll it up i the pastry toward the point, using egg yolk to seal the point to the rolled pastry. Coil the wrapped almond paste and place on the prepared baking pan. Repeat with the remaining almond paste and pastry, then brush all with melted butter and then egg wash. Bake and garnish as directed.